Following the same thought behind my "Decorating on a budget" post I thought I'd do a little roundup of inspiration for interior decor. 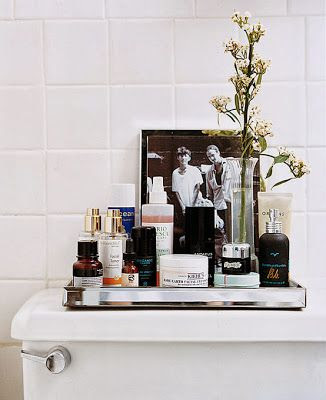 Today's theme is easy bathroom updates. Enjoy! I love the neutral tones in this bathroom, as well as the functionality of the little stool at the bottom. I also am a huge fan of keeping things in baskets. So great! Anytime I see a familiar product in an image I get excited. This one is great regardless of the rose spray. The tray is such a simple concept but I image very effective. The flowers are the perfect finishing touch. Image found here (from a renovation I'm personally obsessed with). I'm a fan of art in a bathroom. Unconventional art, that is. So, not seashells or dolphins. 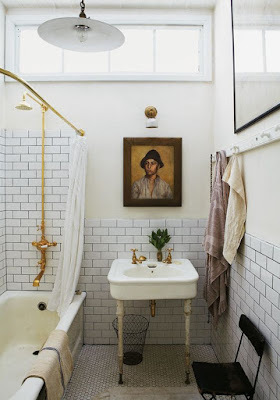 The brass plumbing and subway tiles are also right up my alley. Although of course, those are more long-term and costly changes to make. 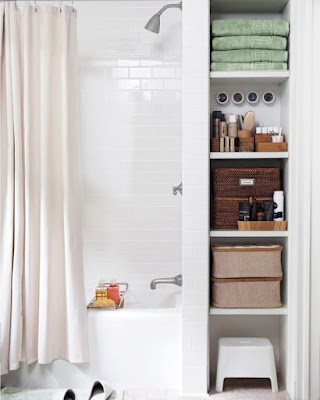 I think any of these could easily be recreated, even in a rental or student apartment to create a much more homey vibe in your bathroom. As always, all original sources are linked in the captions, and of course can also be found on my Pinterest (along side many, many other kinds of interior, fashion, and food inspiration). P.S. Just an update...the baby's breath flowers on the mantle are still going strong!